News and Awards Archive - R. E. Dimond and Associates, Inc.
R.E. Dimond and Associates received Indy Chamber’s 2018 Honor Award for the MEP design of The Cabaret at Indy Chamber’s annual Monumental Awards. The premier awards ceremony celebrates the built environment in the Indy region and recognizes significant achievements by individuals and businesses that contribute to excellence in architecture, interior design, landscape architecture, construction, real estate development, neighborhood revitalization, engineering, innovative reuse and public art throughout the nine-county Indianapolis region. R.E. Dimond and Associates worked with Ratio Architects to provide mechanical, plumbing and fire suppression systems at The Cabaret’s new 10,250 SF headquarters in the historic Metzger Building in downtown Indianapolis. The design team was able to utilize new insulated clear story windows for a matched historical look of the building and an improved envelope energy efficiency. All roof-mounted HVAC equipment required approval from the Indiana Historic Preservation Commission to ensure the new equipment was not visible from street. The mechanical and plumbing design complimented the thoughtfully designed theatre space and helped establish a practical, energy-saving HVAC design for The Cabaret. This design helped create the intimate performance ambiance for an organization that brings world-class Cabaret entertainment to Indianapolis, helping provide revitalization through the arts. R.E. Dimond and Associates received Indy Chamber’s Achievement Award for the MEP engineering of Liberty Fund at Indy Chamber’s annual Monumental Awards. The premier awards ceremony, organized with assistance from the Society for Marketing Professional Services (SMPS), honors the most significant achievements by individuals and businesses that contribute to excellence in architecture, interior design, landscape architecture, construction, real estate development, neighborhood revitalization, engineering, innovative reuse and public art throughout the Indianapolis region. R.E. Dimond and Associates worked with Rowland Design Architects to provide mechanical, electrical, plumbing and fire suppression systems at Liberty Fund’s new 61,000 SF headquarters in Carmel, Indiana. A closed loop geothermal system provides sustainable design that is both cost efficient and easy to maintain. Financial support by R.E. Dimond and Associates, an Indianapolis-based engineering consulting firm, is benefiting learning-in-context curricula in Purdue Polytechnic’s Applied Energy Lab, which is directed by Bill Hutzel, professor of mechanical engineering technology. A portion of the gift provided funding for electrical work managed by Wil Arnett, a graduate research assistant in the School of Engineering Technology, on the recent replacement of Knoy Hall’s rooftop solar array. The old array, which produced about three kilowatts of power, was replaced with new panels that generate up to eight kilowatts of electricity. Polytechnic undergraduate students David Zachman and Paige Henry and master’s degree students Megan Switzer and Jacob Torres had the opportunity to attend the ASHRAE (American Society of Heating, Refrigeration and Air Conditioning Engineers) winter meeting for the “Facilities Engineering Class” in Las Vegas, Nevada, where they networked and learned from industry professionals. ASHRAE is an international organization which focuses on sustainable technology for the built environment. The School of Engineering Technology also updated an in-class heat transfer experiment. Seniors in MET 42100 (Air Conditioning & Refrigeration) developed the experiment by automating the dating collection process. More than 75 sophomores in MET 22000 (Heat & Power) will conduct the improved experiment each semester to learn about conduction heat transfer and PC-based data acquisition. The new experiment yields faster and more accurate experimental results than before the upgrade. R.E. Dimond was founded by Robert “Bob” Dimond (ME ’51) in 1977 with four employees to serve Indiana Bell Telephone, their company’s first client. For 18 years, Dimond built a strong base of satisfied clients while also mentoring his son, Daniel (MET ’82). For the past 22 years, Dan Dimond has led the company, developing the business and expanding in size to 30 employees, with a vision of becoming the most respected engineering consulting firm in the Midwest. Bob’s daughter, Laura Dimond Kelley, an MET ’87 graduate, also worked in the family business as chief operating officer for seven years. Dan and Lynn Dimond’s daughter, Lucy, is a sophomore studying industrial engineering. Bob Dimond served in the Army Air Corps during World War II, working on the development and implementation of radar in a classified capacity. He was a member of the Indiana Society of Professional Engineers, the National Society of Professional Engineers, ASHRAE, and other professional organizations. Robert Dimond passed away in April this year, upon R.E. Dimond and Associates celebrating their 40th Anniversary. 40 years ago, on March 29th, 1977, Bob Dimond founded R.E. 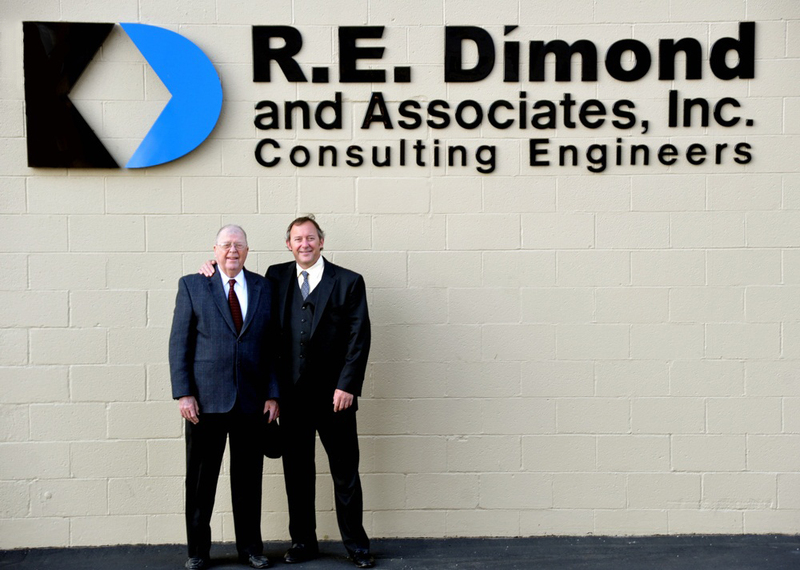 Dimond and Associates, laying the groundwork for a successful consulting engineering firm. Over the years, we have seen the slide rule and Vari-Typer typewriter slip into extinction, the adoption of Building Information Modeling (BIM), and the evolution of new Project Delivery methods. At R.E. Dimond and Associates, we more than quadrupled the number of engineers, designers, technicians, and administrative staff, we added Energy Services, Construction Administration and Commissioning departments, growing responsibly and sustainably. In partnership with many of the Midwest’s finest architects, engineers, owners, contractors and vendors, we have forged long-lasting relationships, both professionally and personally. The entire team at R.E. Dimond and Associates thank you for your confidence and trust. We continue to be committed to delivering exemplary technical design services that solve clients’ building design and execution challenges professionally, and to their total satisfaction. Building Excellence magazine featured R.E. Dimond and Associates renovation of Indiana State University’s Mill’s Hall as an example of a modern, efficient heating and cooling building system design in a building that was really never designed for it. Multiple aspects of energy efficiency including Silver LEED certification and a projected 18.2 percent savings of total energy costs over a baseline system contributed to the recognition of R.E. Dimond’s design. Additionally, the renovation of Steak ‘n Shake’s 100 year old downtown Indianapolis headquarters was highlighted in this issue. The utilization of the VRF heating and cooling system paired with an energy recovery wheel in the rooftop ventilation unit and LED lighting design saved 45% compared to the Indiana Energy Code. The city of Elkhart has been honored for saving The Lerner theater. Indiana Landmarks has awarded the annual Cook Cup for Outstanding Restoration to Elkhart in recognition of efforts to rescue the 1924 venue. The organization has also unveiled its annual list of Indiana’s 10 Most Endangered landmarks. The person behind the transformation of a historic hotel in Wabash is being honored by Indiana Landmarks. The organization will present its Cook Cup for Outstanding Restoration to Richard Ford this weekend. He has renovated the original Hotel Indiana in Wabash into the current Charley Creek Inn. American School & University, an organization for education facilities and business professionals, named renovations to Pickerl Hall and the Bayh College of Education as among the Best in the Nation in its 2011 Architectural Portfolio. Multiple aspects of each project, including sustainability and community connection, were used in determining the selections. The Jefferson County Courthouse in Madison has reopened more than two years after a major fire. Indianapolis-based architecture and engineering firm American Structurepoint Inc. oversaw the $6 million project.